Ever done something embarrassing? Something that made your face flush? Something that makes your “flight” defense mechanism kick in? Sorry to bring up old memories, but I just had this happen last evening. In delivering a welcome at my church, I managed to completely forget the end of the welcome and (in keeping with my high enthusiasm) proceeded to enter complete discombobulation time. It was redonkeykongulous! I am OK with everything I said, and I am confident that it came from the right fuel. However, it was not what was planned. 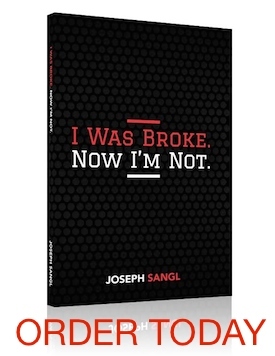 A new level of humility has been achieved in the life of Joseph Sangl! Ever had anything happen humiliating with your finances? Bankruptcy? Collections calls? Bounced checks? You can recover! It will refine you. BUT IT WILL NOT DEFINE WHO YOU WILL BECOME if you resolve to make it better! I resolve to make the next welcome better!